The father said the previous night, two of his children had drawn on each other’s faces with permanent markers. 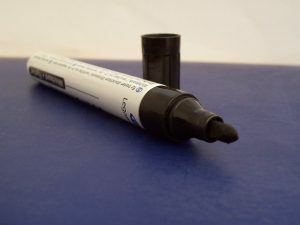 When he realized what they had done, he did his best to wash off the black marker with soap and water, but, as most people are familiar, it is very difficult to get all the marker off, and it is usually necessary to just wait until it fades on its own. This can usually take a day or two, but there is no harm caused by the marks other than how it looks. However, when he took his son to daycare the next day, he told the staff about the markers and said he did the best he could to wash it off, but not to worry about it. He alleges that the teacher failed to take his advice because the child was covered with red abrasions and scabs as well as what looked like bruises on his face. His father took pictures of these marks, and they are clearly visible in the photographs. He then took his child to the hospital for treatment of what he considers serious injury. He asked his son what happened and the son allegedly said the teacher kept trying to rub marker off and was rubbing very hard. The father asked why he didn’t simply walk away, and he said the teacher held him there even though he was crying out from the pain. The father then called the daycare to center to find out how this was allowed to happen and why the daycare worker injured his son. He said the daycare owner insisted that her staff would never try to harm a child and was only doing what she believed was in the child’s best interest. He was not satisfied with the answer and called the local police who say they are now investigating the incident. They have not said if they will file any charges as the investigation is still ongoing. It should be noted the daycare owners and their staff have not been charged with any crime as of this time and are still presumed innocent unless they are convicted in a court of law should they eventually be charged. However, as our Boston daycare injury attorneys can explain, there is very different standard of proof needed to recover damages in a civil case than there is to prove guilt in a criminal case. In many personal injury cases, the police may never charge the defendant with a crime, but that does not mean there is not a valid claim for negligence. In addition to the standard of proof, a civil negligence case requires that a defendant failed to act in a reasonable and prudent manner to prevent foreseeable injury to foreseeable persons and property. In a criminal case, intentional conduct is usually required.